The Italian sculptor Agostino d'Antonio spent years chipping away at one particular huge mass of marble. Frustrated with his inability to turn the marble into art, he eventually cried out, "I can do nothing with it!" Other sculptors then took their turn at the stubborn stone but also came away dejected. Then, along came Michelangelo who examined the stone and found a different vision for it from his contemporaries. Soon after, the world had another marble masterpiece from the great artist, who saw change, embraced it and made it happen. 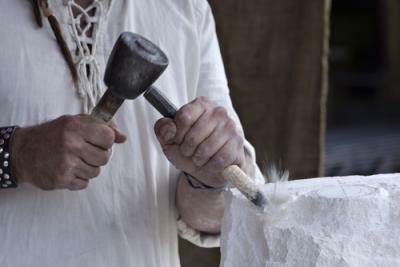 Much easier than chiseling at a chunk of stone for years, voters in MA voted recently for change. Last Nov, voters approved a ballot measure that mandates paid sick leave policies for most employers in the state. The ballot measure offers a reminder to bank HR managers that personnel policies continue to change, to review the implications of new laws and consider the trend toward more paid sick leave in general. While banks typically have more generous leave policies than other small businesses, it's still a good idea to review your bank's policies and be certain they are up to date. Many small businesses who are bank customers could also be affected by such policies and may have questions on how best to address transforming personnel practices. Beyond simply meeting legal personnel requirements, having policies that attract and retain quality employees should be considered best practice for any business. There is still work to be done in many places. For example the Institute for Women's Policy Research found that 40% of private sector workers have no access to paid sick days at all. The BLS reports that among companies with 99 or fewer employees, a little more than 50% of workers have access to paid sick leave. The BLS found larger firms have a better record with approximately 65% of workers receiving paid time off for illness. Overall, it appears most workers who have sick leave receive about 8 sick days off annually but typically use only an average of 3.5 days. On the other side of the coin, requirements to increase sick days means more workers may use them, leading to additional costs for the business. This can reduce company flexibility and new laws may add another layer of regulations. But having workers come to work ill and expose others or who perform at lower levels because they are sick is generally false economics. No matter where your bank is located, the MA initiative is worthy of monitoring. It guarantees workers up to 40 hours of paid sick time annually (as long as they work for companies with 11 or more employees) and voters in NJ and CA have also approved similar measures last year as the trend spreads. HR managers and business customers may be interested in the details of the MA law which include: employees may accrue and use 1 hour of paid sick leave for every 30 hours worked (totaling at least 40 hours per calendar year); workers can use approved, paid sick time to care for a sick or injured family member; workers can use the time to go to routine doctors' appointments on their own or with a family member; and workers can carry over unused sick time (up to 40 hours annually) into the next calendar year. States across the country may or may not emulate the MA paid sick leave initiative, but given a strengthening jobs market, we thought you should at least know about it. After all, community banks and their customers that are ahead of the curve and who embrace change should gain a competitive edge by doing so - just like Michelangelo did with that big block of marble. Beyond that, you are chipping away at any reasons customers or employees would even consider a competitor over your bank. Treasury yields rose 4bps as heavy corporate supply drove down demand for the safe-haven asset. Yields are currently unchanged ahead of retail sales. Choice Financial Group ($942mm, ND) will buy Northland Financial ($197mm, ND) for an undisclosed sum. In past weeks some of the largest banks have announced large job cuts, as they adapt models to ongoing changes in the industry and increased regulation. Announcements include: HSBC (25,000 jobs; closing 12% of branches; shrinking investment banking by 33%; selling operations in Turkey and Brazil w/25,000 additional employees); JPMorgan Chase (5,000 jobs); Royal Bank of Scotland (14,000 jobs; cutting 80% of investment banking); and Barclays (19,000 jobs). Industry experts anticipate other large banks will likely soon announce job reductions as well. The Wall Street Journal reports data from Equifax finds borrowers on home equity lines of credit (HELOC) are increasingly getting behind on their payments. The data finds 4.3% of borrowers from 2004 were delinquent 30 days or more vs. the 2.7% level just one month before the end of the interest only (IO) period. That is worrisome when you consider IO periods usually run 10Ys and the volume of HELOCs originated did not reach their peak until 2007 (about 275% above 2004 levels). That means bankers still face a wall of maturities that remain high until about 2019. 1) Larry Lindsey (former FOMC member and director of the National Economic Council to the President) predicts the Fed may be forced to tighten at a faster pace than anticipated. 2) Charles Plosser (former president Fed PA) said keeping monetary policy calibrated to the "same level" as during the "depths of the financial crisis" doesn't make sense and as the economy improves, policy should change as well. A survey of large business CEOs by the Business Roundtable finds 70% expect sales to increase in the next 6 months vs. 80% who felt that way in Q1. As a result, only 35% said they planned to increase capital spending vs. 45% in Q1. You should note that the International Trade Association finds a record 305,000 US companies exported goods in 2012 and 98% of those were small or medium-sized companies. Call us to find out about international services and we can help you capture and keep these customers, as you earn noninterest income along the way.